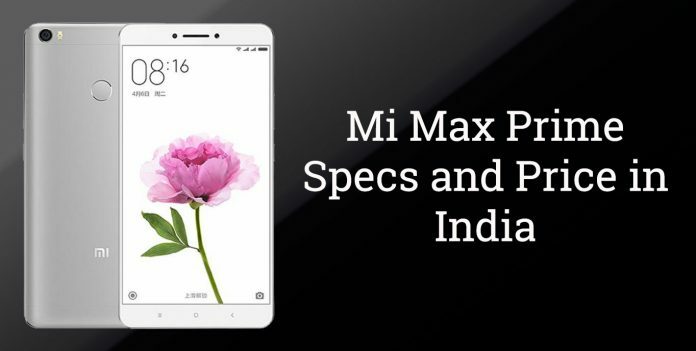 Xiaomi has just announced Mi Max Prime in India with a price tag of Rs. 19,999. The phone will be available from 17th October in the official website, as a part of Diwali offer. Mi Max Prime is an extended or upgraded version of Mi Max which was released a couple of months back. The Prime variant has only got the upgrade in terms of processor, RAM, and internal storage, while all other specifications are still inherited from Mi Max. Mi Max Prime features a large 6.44-inch display with a resolution of 1080 x 1920 pixels. It runs on the latest version of MIUI 8.0 which is based on Android Marshmallow. As compared to Mi Max, the Prime variant is powered by Snapdragon 652 instead of Snapdragon 650. RAM has also been upgraded to 4GB as compared to 3GB in Max. The internal memory has got a massive bump from 32GB to 128GB. The support for microSD card up to 128GB is still available on both the smartphones. When it comes to photography, Mi Max Prime features a 16MP primary camera with phase detection autofocus (PDAF), f/2.0 aperture, and LED flash. On the front, it holds a 5MP secondary camera for video calls and selfies. The device is fueled by massive 4850 mAh battery that can deliver a full day backup with normal usage. Overall, Mi Max Prime is a good deal for Rs. 19,999 if you are interested in big smartphones (phablets). The other notable features are 4G LTE with VoLTE, Bluetooth 4.1, GPS/ A-GPS with Glonass, Wi-Fi 802.11ac, IR blaster and a 3.5mm audio jack. As mentioned earlier, Mi Max Prime will be available on mi.com starting from 17th October as a Diwali offer for Rs. 19,999. For more updates on upcoming Xiaomi devices, stay tuned with us.